If you're familiar with compressing your own JPEG images for the web, chances are you've noticed Blogger's annoying habit of compressing uploaded images even further. The results aren't pretty and waste all the time you've spent optimizing your images. You could upload images in PNG format but PNG files can be much larger than JPEGs and will eat up both more bandwidth and free image-hosting space. In order to upload JPEGs with their original compression you'll have to sidestep Blogger's image uploader and go straight to Picasa's downloadable uploader. (Picasa is Google's image-hoster which stores all the images you upload to Blogger). 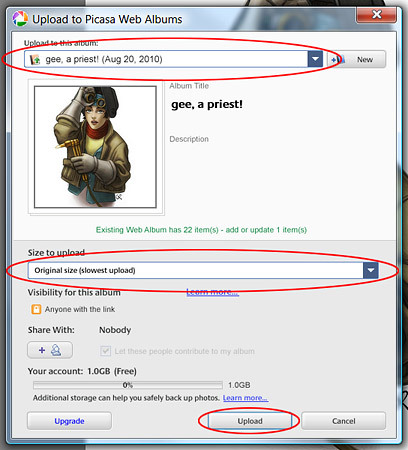 This article describes how to upload original compression JPEGs to Picasa and then display them in your blog. As mentioned above, Picasa is Google's image-hosting service which hosts all the images you upload to Blogger. In order to see all the images you've ever uploaded to your blog, you can sign in to your Picasa account (same login as your Google account) and click on the album named after your blog. To upload JPEG images with their original compression, you will have to download and install the free Picasa photo editing software (link). After installing, Picasa will want to index the images on your computer. This could take time so be prepared to wait a while before proceeding. Picasa will probably still be useable while indexing, however. Browse to the image you want to upload and then double-click it. If you don't find the file you're looking for then you might have to browse for the file manually (this means Picasa didn't find the file when indexing your hard drive). 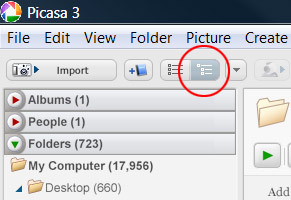 Use 'Add File to Picasa...' from the Picasa 'File' menu to browse for the file using the standard file browser for your operating system. 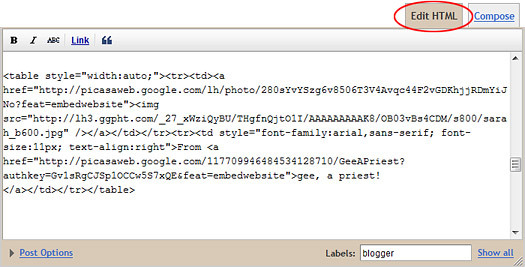 From the first drop-down list in the new dialog box which opens, choose the Picasa web album named after your blog. 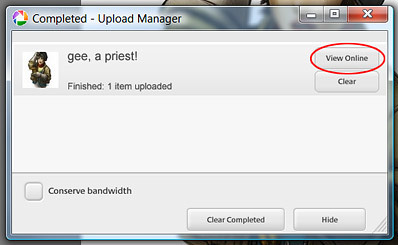 For 'Size to upload', choose 'Original size (slowest upload)', and then click 'Upload'. 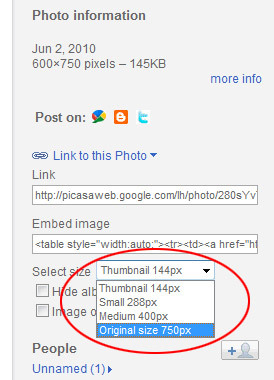 After the image has uploaded, click the 'View Online' button to be taken directly to your Picasa web album. Click in the 'Embed image' field to select the text, then press 'Ctrl+C' to copy the code to your clipboard. In your blog post editor, switch to 'Edit HTML' mode and then paste the code ('Ctrl-V') where you would like the image to appear. 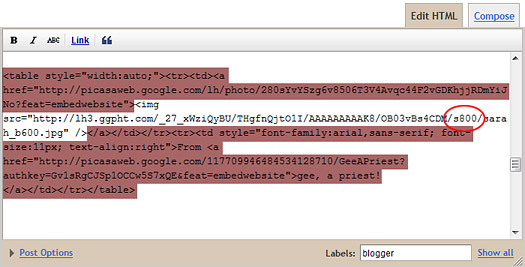 To simplify the code, you can delete the tags I've highlighted below. All you really need is the content within the <img> tag. 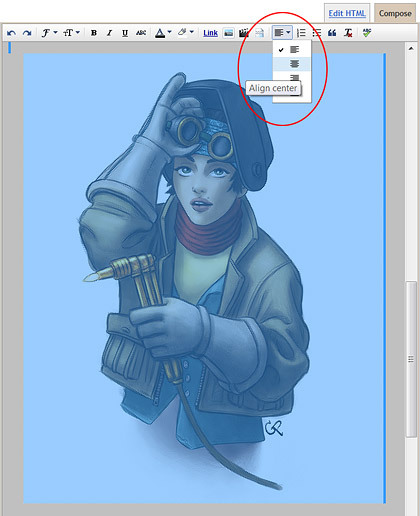 If you wish to center the image, switch back to 'Compose' mode, drag over the image to select it, and then change the alignment to 'center'. 3.) Linking to Images larger than 800 pixels. Usually, 800 pixels is plenty big enough for images displayed on a blog. However, if you have an image with a vertical dimension bigger than 800 pixels, or you just want to show a larger image, you can modify the code that you cut and paste from your Picasa album to show images up to 1600 pixels per side. The portion of code preceded by an 's', like in '/s800/', represents the max thumbnail size for the image. This means that the image's largest side must be smaller than 800 pixels, or else the image will be shrunk to fit. Though Blogger tries to simplify posting images to blogs, it also overly compresses JPEG images, complicating things for people that prefer to compress their own files. By allowing the alternative PNG format, Blogger also tends to encourage these users to upload images with a larger file size, which can use up more bandwidth and image-hosting space. Fortunately, the free Picasa photo-editing software offered by Google can be used to upload original quality JPEGs which, with a little HTML editing, can be displayed in high-quality on a blog. It's the only way I've found so far. Hopefully Google will fix this, as the simplest alternative (using PNGs) uses more disk space for them. Thanks for posting this. I've been annoyed as hell at the poor quality of my images on Blogger. I'm going to try this fix. Couple of bumps at first. Picasa 3 (beta) works on Ubuntu 10.10, Picasa 2.7 doesn't :(. Have to place pics on the Desktop for Picasa to detect them, otherwise pics are not detected when placed somewhere in Ubuntu's system. Though, you can notice that i didn't follow your guide exactly. Thanks for this. I've just done some research after a comment about the quality of a pic on my blog and I discovered this post. Followed the instructions and it now looks loads better. Google Picasa is perhaps the best Digital Photography Freeware software.